Architects, builders, and homeowners continue to creatively disrupt traditional architectural design by utilizing various materials that were once less accessible. Montana Timber Products is the choice supplier of reclaimed barn wood, reclaimed barn wood alternatives, and shou sugi ban Japanese style, scorched wood. 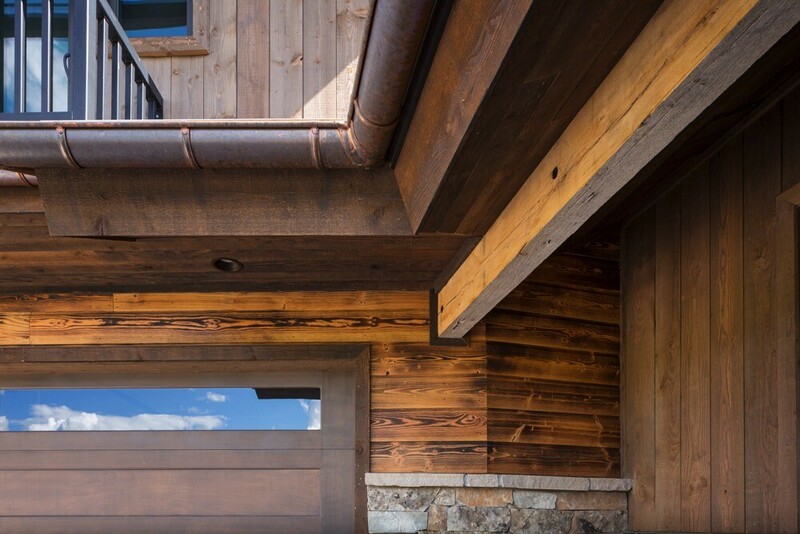 This week’s featured project takes us to Park City, Utah and displays a unique combination of rustic and traditional building materials, including Montana Timber Products’ ranchwood™, Charwood™, and traditional reclaimed barn wood. The photo below gives a great snapshot of the various materials used for this build. The off-gray vertical Shiplap in the top left portion of the photo is part of the AquaFir™ product line. When compared to the brown 2″ ranchwood™ trim below the copper gutter and the ranchwood™ vertical Shiplap (bottom right), you can see that the ranchwood™ has greater color variation between the soft and hard grain of the wood, giving it a slightly more rustic look compared to the AquaFir™. The lower left hand portion of the photo is the Charwood™ Tiger, horizontal Shiplap siding, easily distinguishable by the tiger striped wood grain created by the Shou-sugi-ban burning process. The inception of Shou-Sugi-Ban, the centuries old traditional Japanese method of charring wood, was the result of the need for low maintenance, rot, pest, and fire resistant wood siding and fencing. Montana Timber Products’ Charwood™ product line, provides three variations of natural, NO VOC, Shou-Sugi-Ban wood. These three variations include Tiger (above), Ebony, and Gator. The different levels of burn result in various wood grain patterns. The above photo displays the use of traditional reclaimed barn wood for the structural beams and wood slat awning. Montana Timber Products offers Corral Board, a true reclaimed barn wood. Corral Board, weathered from decades of prairie winds, sun, and precipitation, it is left with a Silver Patina finish, bands of moss, and authentic fastener holes. As the proven market leader in reclaimed barn wood, reclaimed barn wood alternatives, and charred Japanese style Shou-sugi-ban, you will be sure to find the solution to your next commercial or residential build.